Every movie has a target audience. Unplanned is no different. It also has whatever the opposite of a target audience is. 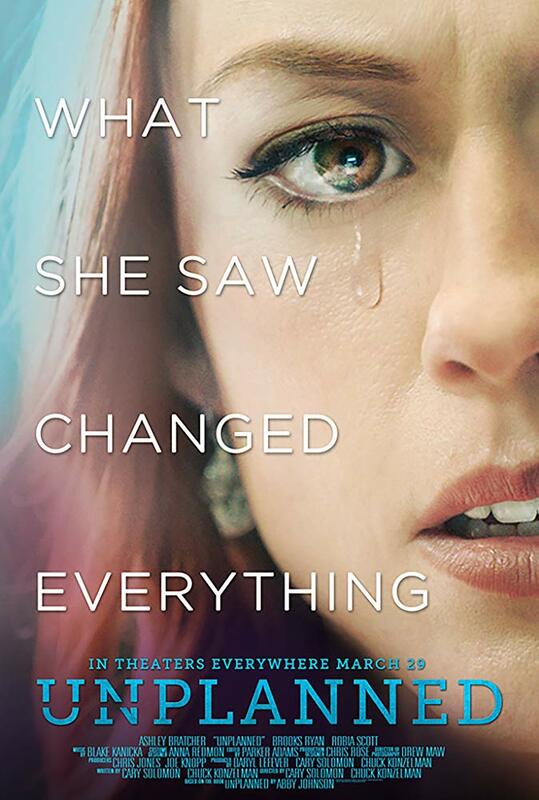 The film – which is the first R-rated release from faith-based distributor Pure Flix – is about abortion and it casts Planned Parenthood as the villain. Obviously, people who are extremely pro-choice and supporters of PPFA probably aren't going to go anywhere near it. So let's look at the movie from the perspective of those who are either pro-life or ambivalent in their opinions of abortion and Planned Parenthood. They will find a reasonably engaging story about a woman who has a crisis of conscience at her job, anchored by a strong leading performance. The film is based on the true story of Abby Johnson. Portrayed by Ashley Bratcher, Abby is an idealistic young woman who gets a job at her local Planned Parenthood clinic. She likes helping other women and quickly rises in the ranks, eventually becoming the clinic's director. Her parents and husband disapprove of her employment, specifically because of the abortions provided there. Abby tries to convince them that they are wrong, just as she does almost daily with the protesters from pro-life group 40 Days For Life who congregate outside. Early scenes in the film have some good back-and-forth dialogue about the merits of choice versus the belief that abortion is ending a life. Both viewpoints are fairly well-represented, which makes for engaging conversations between Abby and the protesters/her family. Unplanned also offers useful information on how the abortion procedure is carried out. That's something a lot of people don't know in much detail. Although filmmakers Chuck Konzelman and Carey Solomon (God's Not Dead 1 and 2) come down squarely on the anti-PPFA side, they do offer positive portrayals of the ground-level workers at the clinic, a refusal to judge women who have had abortions, and a willingness to include the other side's ideas. Unplanned is, for the most part, a personal story. Emphasis is on Abby Johnson's experience and how it changes her. She holds one set of beliefs, then modifies those beliefs after accumulating information that had not been so viscerally available before. What once seemed right now seems wrong, so she decides to adjust her own actions. Whether you agree with her or not, the movie works on the level of a character study. We've all, at some point, changed our mind on an issue that affected us intimately. In that sense, the heroine's journey is relatable. Ashley Bratcher (War Room) is excellent as Abby. By virtue of the film's controversial subject matter, one might expect a histrionic lead performance that focuses on hitting the bigger notes much more than the smaller ones. Bratcher avoids that temptation, bringing nuance and empathy to her work. The actress credibly depicts Abby's shift in worldview and, more urgently, the sense of guilt Abby feels over having taken part in something she grows to find abhorrent. The third act is where Unplanned becomes most overtly partisan and really starts to demonize Planned Parenthood. The organization's executives, who take Abby to court, are portrayed as one-dimensional fiends. (There's even the requisite George Soros shout-out, because that nail can apparently never be hit on the head too much.) A lack of subtlety in this regard is easily the film's biggest flaw. Konzelman and Solomon preach vociferously to the choir in the final half hour. The choir will respond enthusiastically, especially in a cringe-inducing moment of pandering that features a cameo from executive producer/MyPillow CEO Mike Lindell. If the point is to change minds, the heavy-handed approach in the finale may cause on-the-fence viewers to get their backs up instead. Thankfully, Abby still remains the crux of the picture during this time, and the final beat nicely hones in on the emotional core of her journey. Unplanned obviously presents a one-sided portrait of Planned Parenthood that some will find objectionable. But the movie is intended to argue in favor of a specific position, which it does with earnestness. Those inclined to listen to that argument will walk away satisfied, not just with the message delivery but also with the cinematic experience provided. Unplanned is rated R for some disturbing/bloody images. The running time is 1 hour and 46 minutes.